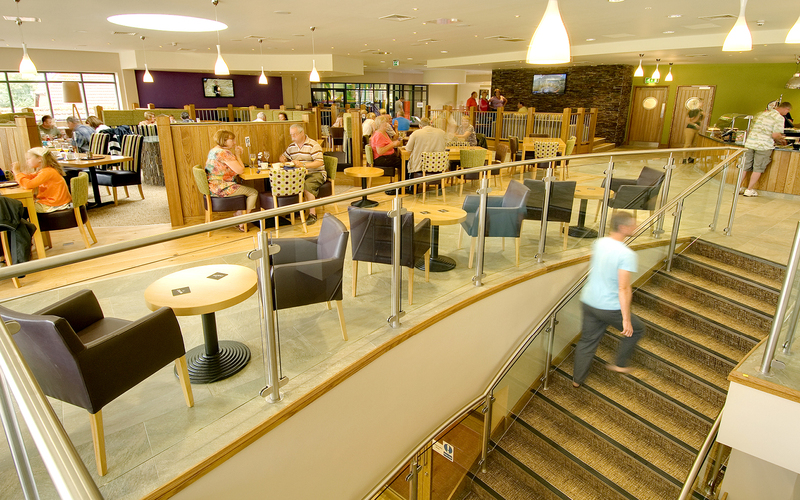 Holiday Park restaurants and cafes are a vital part of the of providing the best possible holiday customer experience. In high season the challenge of having of all of your guests in one place at the same time with the same need can lead to an extreme test of both staff and facilities. Having been an interior design professional for 34 years, over the last 8 I have spent time working with some wonderful holiday park clients. I have found that you can make a massive difference to your on-site catering offer by doing a few things. Your service and customer experience can be transformed through implementing these effective interior design solutions. Ensure that the routes to service points, such bars and serverys are clear and intuitive. If queues are unavoidable create space that doesn’t overbear on customers who are already seated. Use high backed banquettes or screens to provide structure to large spaces and separate the standing from the seated guests. Ensure servery and bar layouts will provide a logical and efficient workflow for staff. Watching someone run around needlessly to fulfil an order creates delays and therefore stress to both staff and guests. Larger bars and servery provision can be broken down into sections where most if not all items can be served within one or two steps and without the need to cross the path of another team member. Ensuring a route for customer flow will reduce stress in both staff and customers, therefore making sales easier and quicker and guests are more likely to stay in your park for meals. Frequency and volume of transaction are guaranteed and staff are capable of doing more, reducing labour costs. Also, relaxed customers are very likely to spend more increasing the spend per head. People in large spaces generate a lot of noise so pay attention to what materials you use on surfaces. Easy to clean hard surfaces such as tiles and laminate ensure every sound reverberates and lingers. Dragging chairs, excited children and exuberant guests combine. In order to be heard people raise their voices. Noise-induced stress can affect staff and deter customers, especially those without children. There are two basic strategies to improve the acoustic quality of a space. Reduce the cause and the effect of unwanted noise. Dragging chairs, banging doors, coffee machines, catering equipment, kitchen staff and equipment all generate problems. Isolate and treat each one through detailed design responses. Reducing the source of noise is only part of the solution and even if were achievable a silent space is not good for relaxed holiday dining. Sound reverberation is caused by hard surfaces bouncing and in some cases amplifying noise within a space, so it lingers longer and combines with other sources. Soft surfaces will absorb sound – curtains, upholstery, rugs and carpet are good for this. Deflect sound by using non-flat surfaces – facetted wall finishes such as timber or tiles can do this, as will non-flat ceilings. In large spaces ensure there is subdivision at seated head height – meaning table conversation cannot travel from one side of the room to the other – and back if its a flat wall with a hard finish. Most holiday park F&B facilities operate at different times of the day or all day and into the evening. One option ‘blanket’ lighting solution will lead to a well lit but clinical effect, particularly in the evening. One product that is very popular at the moment but produces this effect is LED recessed square panel. A good product for kitchens and operating theatres but never use these in a hospitality environment – never! Design lighting that can respond to the changing needs of the time of day and customer needs. In very basic terms lunch and breakfast will need more light than dinner. Individual dimmers are impossible to manage and staff will simply have the dimmers either fully on or off. Think about simple switching and dimming that has simple options. Seating and customer flow must work together. Think about height and how they relate to one another. Dining and lounging areas should not be dominated by standing and queuing customers. Use stools and high benches where seating is required in high traffic areas. Provide screens to create some protection and more personal places for diners. Consider creating areas specifically for families and large groups. This will typically use tables and chairs that can easily be arranged to accommodate 8,10 or 12 people for all ages. In all likely hood, this will lead to a lively part of the restaurant. Raised flooring, change of furniture or ‘wait to be seated areas’ can provide couples with an area with a little more calm in an alternative location within the same space. Following these lesson guides and implementing them into a refurbishment design for a cafe or restaurant is guaranteed to give you positive results.